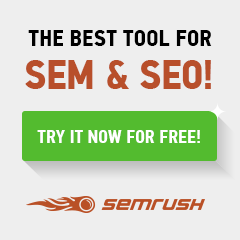 Following NASCAR: It's Not What You Think! 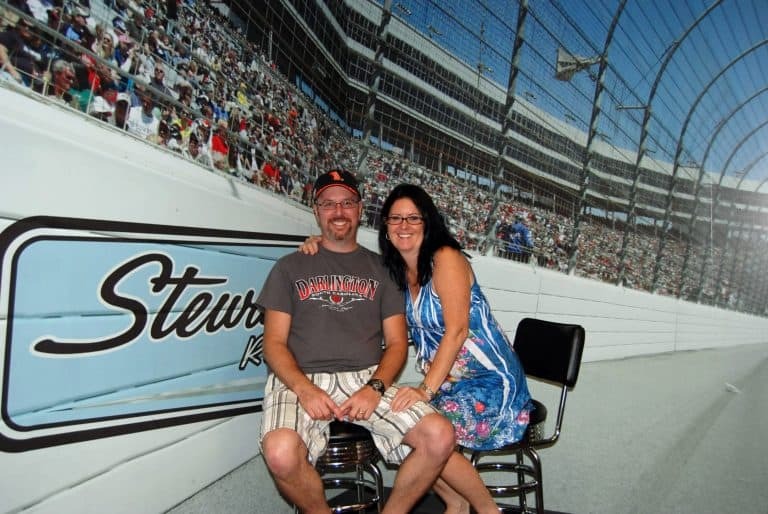 You are here: Home / Travel / Following NASCAR: It’s Not What You Think! Back in early 2004, we were reeling from our son’s diagnosis of autism. We didn’t get out together a lot and we weren’t sleeping nearly enough. Date night had taken a back seat to deciding who was going to handle the next meltdown. 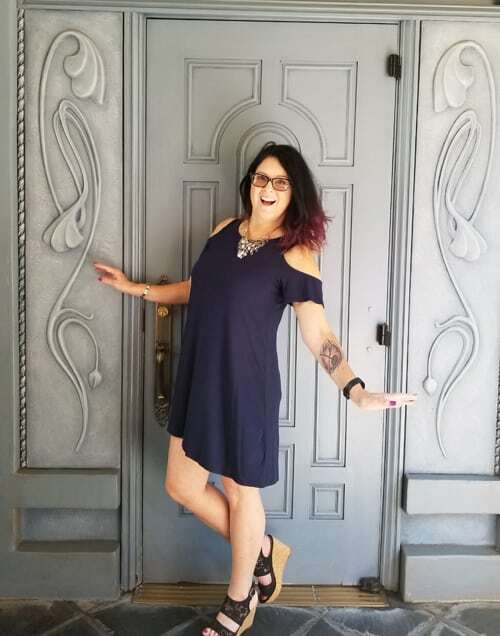 I was working at home full-time, struggling to hang onto the job with a boss that was far from compassionate, and the husband was dealing with working 12-hour days, only to come home to be my wingman so I could take a shower without worrying that the little guy was going to try to escape. Then he filled me in: suite tickets. We’re in a private area with an open bar and all-day buffet. You’ll watch the race with other adults — so you can talk with other adults — from inside a booth overlooking pit road. You’ll have a up-close view of the action and if that gets to be too much, we can go stand up top and watch. To this day, I’m not sure what sold me more. Open bar? Buffet of food I didn’t have to cook? Adult conversation? Or not having to figure out how to stop my son from banging his head into the floor? I’m leaning towards open bar, a luxury I didn’t have time for when doing 24/7 special needs child care while working 40 hours a week. We got dressed in jeans and t-shirts, hoodies in hand. Headed to the track. “No, sir, you don’t park here. You’re infield.” What the what? 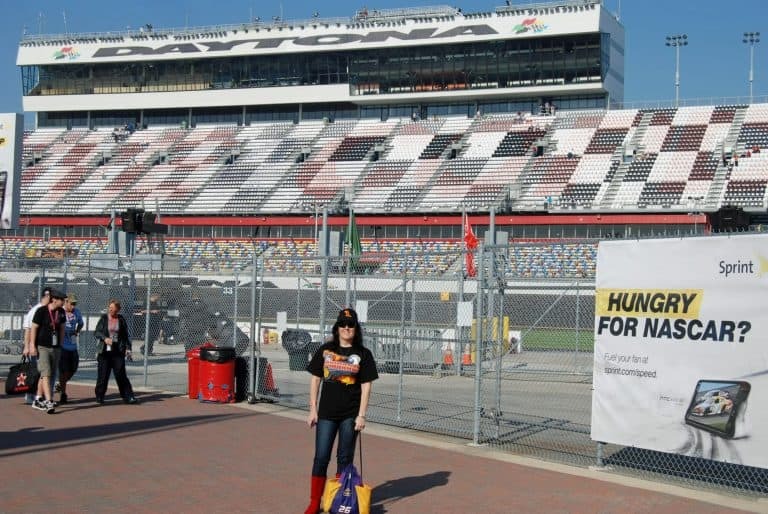 Indeed, we had spots next to the pit road entrance, through the tunnel under the track, dead-center infield. Okay, dude, this idea’s growing on me. Just a few short hours later, I was hooked. Hooked beyond hooked. I loved it. The smell, the sound, the action. 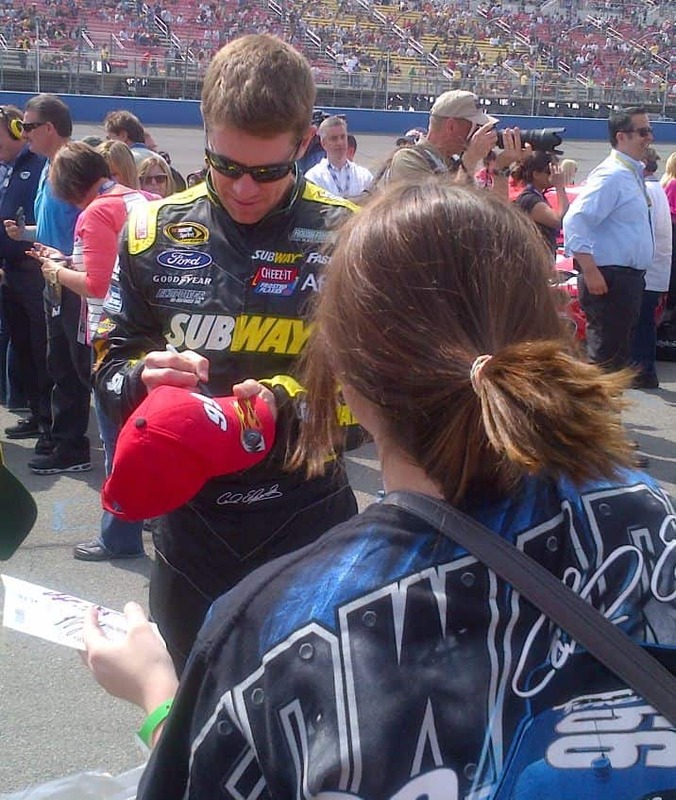 We spent the weekend at the track, following our new driver, Jamie McMurray. How did we choose him? 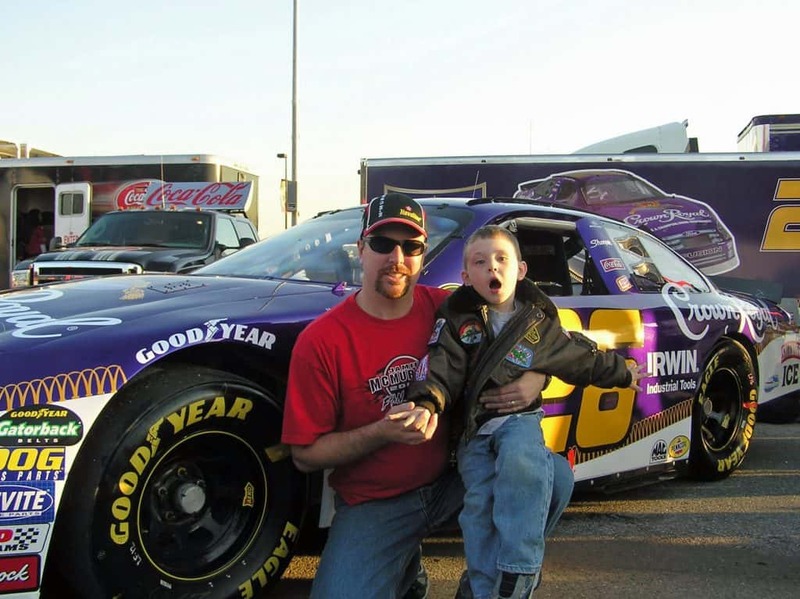 Don’t judge, but I looked at the drivers listed on the site and found that one of Jamie’s sponsors was the National Autism Society. It was a sign. All these years later, we still follow Jamie. We’ve met him numerous times and once, after a miscommunication where he didn’t attend an autograph session, his then-sponsor (Crown Royal) sent Little Dude a box full of amazing stuff. That won us all over. 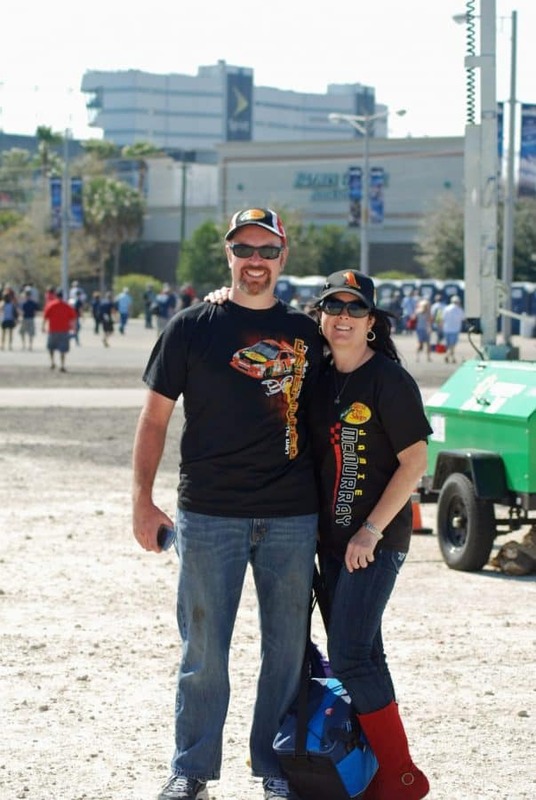 Over the years, we’ve attended races from as far north as Sonoma Raceway to Dover International Speedway in Delaware. We’ve visited Talladega, Atlanta, Martinsville, Darlington, Richmond, Phoenix, Indianapolis and Charlotte. My favorites? Bristol Motor Speedway in Tennessee, the Daytona 500 in Florida, and Las Vegas Motor Speedway. I love the front row seats we get yearly in Vegas, the perfect seats anywhere at the extremely loud Bristol track and of course, the history behind Daytona International Speedway. We’ve traveled almost eight hours in one day, one-way, to see a race. Then we did it again the next day, right after the race ended. We’ve sat through pouring rain hoping it will stop so the jet dryers can dry the track, and we even napped under the stands while the storms left. And at Auto Club Speedway, our home track here in Fontana, we’ve hidden in remnants of shade trying to stay cool when it’s 118 degrees out over Labor Day. And we love every single second of it. All in the name of NASCAR! We’ve stayed infield, shared hotel rooms, backed the car into the hill squeezing into the last parking spot, driven under barriers, snuck into driver RV lots (just to wander, we’re not stalker-y), and walked into weird areas like we owned it, even though we weren’t allowed. We’ve come out of bathrooms and walked into drivers, turned corners on tours (going right when the guide went left) and ended up in inspection viewing area. Walked on tracks by day, laid on them by night, watched concerts of big names, and small, front row. Yeah, NASCAR sounds boring, right?? NASCAR gets a bad rap. To the new viewer, it may seem like a whole lot of left turns, but it’s so much more than that. Strategy — when to gas up, when to fix something, when to pit. Luck — hope you don’t blow a tire or an engine. Being in the right place at the right time if another driver wrecks, since you don’t want to get collected. Listen to a driver and crew chief conversation via a headset just 20-30 minutes and you’ll be impressed with all the calls and discussions they have just to get through the race. Sometimes the language is colorful; other times, you listen to a driver sing. Still sound boring? NASCAR fans are some of the kindest people you’ll ever meet. They’ll share space at the concrete divider so everyone can get up front in autograph alley. Need some water? Here you go. You might get handed an extra beer or a shot if you happen to walk by at the right time. My first real Tennessee whisky was given to me in Bristol, while listening to apropos bluegrass music played by a single man with a banjo on a stage behind me. And then there are the air shows. Other favorite memories? Eating real pulled pork that you will talk about forever in Darlington, South Carolina. Having the president of the company sponsoring the race, also in Darlington, seeing me limp and telling us to jump quickly onto his golf cart or he’ll gosh darn leave without us. Getting picked up by the driver shuttle at Bristol when he had empty seats after taking drivers from their helicopter. 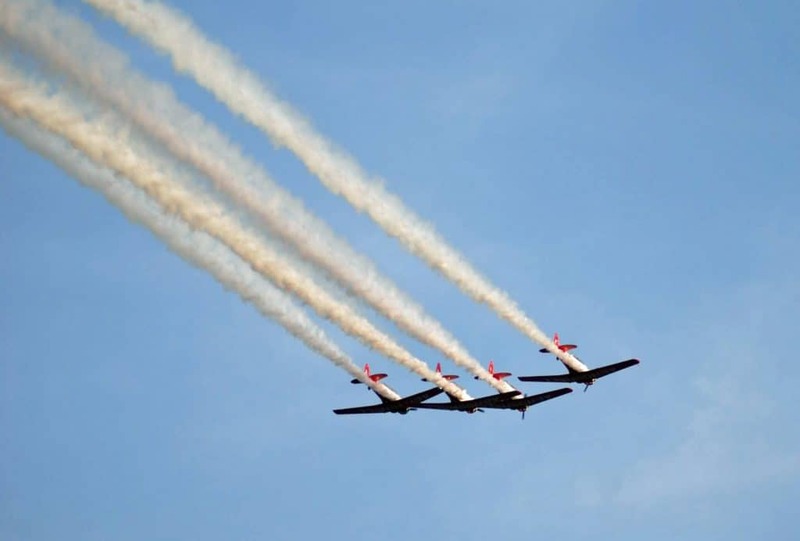 Silly conversation with Thunderbird pilots heading into the Vegas infield before their pre-race show. 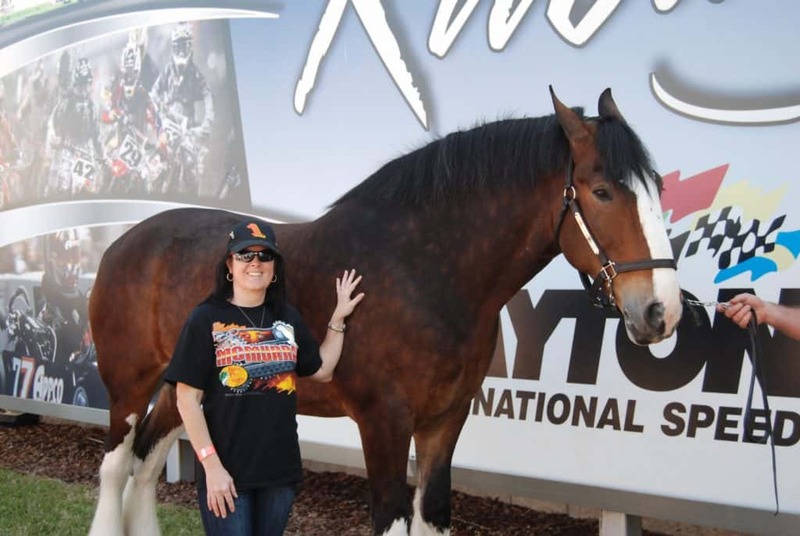 Petting a Clydesdale at the Daytona 500. Meeting Eric Dane after a Fontana pre-race driver intro. Sneaking over the divider to watch car adjustments during practice, getting tapped on the shoulder by security every seven minutes if I didn’t leave in time, and having the Rusty Wallace team crew chief helping me time it so I stopped getting caught…then welcoming me back, over and over. That man had the patience of a saint. Climbing, with my daughter, into the flag stands at Charlotte and pretending to wave the flag. Having Carl Edwards pull my younger daughter onto pit road during press time, for photos and an autograph, because she was dressed head-to-toe in his gear. 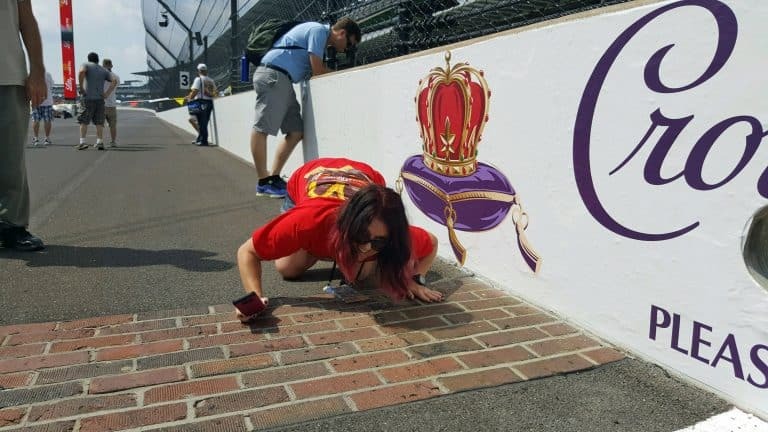 Kissing the bricks at Indy. Then there were the times that Jamie’s crew posed for photos with me. That time they invited me up into the pit box or when they tried to let me climb into the pit box at Martinsville but the security said no, so they all came to the edge and posed with me. Then one of them brought me Jamie’s day visor later. Staying infield or even just tailgating, people walk by and give you food to try. They share their beverages and their barbecue. One time, two guys thought a friend and I were impressed with their shirtless chests as they played football, loudly, in the lot…while our guys wandered…until one mis-threw and hit me, hard, straight in the head. We’ve made friends, sharing a bottle of Crown Royal, that we still talk to almost a decade later. We’ve danced on portable dance floors by a portable Wal-Mart, caught thrown beads (but refused to do the work), eaten dinner for breakfast while laughing with our parking lot neighbors…the stories go on and on. It’s not what you think. 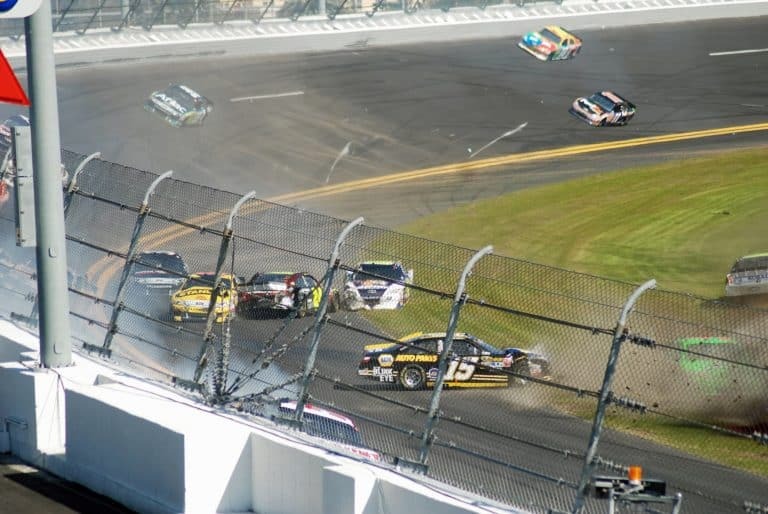 Following NASCAR is not an inexpensive sport and it takes a lot of logic and smarts. We party but we spend a lot of money and we mean business. Our drivers are OUR DRIVERS. We take it seriously. We teach newbies and throw stats with the diehards. We will travel long distances to watch races and when we can’t, we’ll invite anyone interested in learning about the sport to watch in our living room on our 65″ TV with a Bose speaker designed to make us feel like we’re at the track. The only thing that’s missing at our house on race day is the smell of burnt rubber. Anyone have a resolution for that? Our only rule: you must watch the race, because the only time we really want to talk is during commercials. Someday I’ll share our stories about riding in real race cars on the tracks or how I took mine onto Darlington Speedway. Next up? 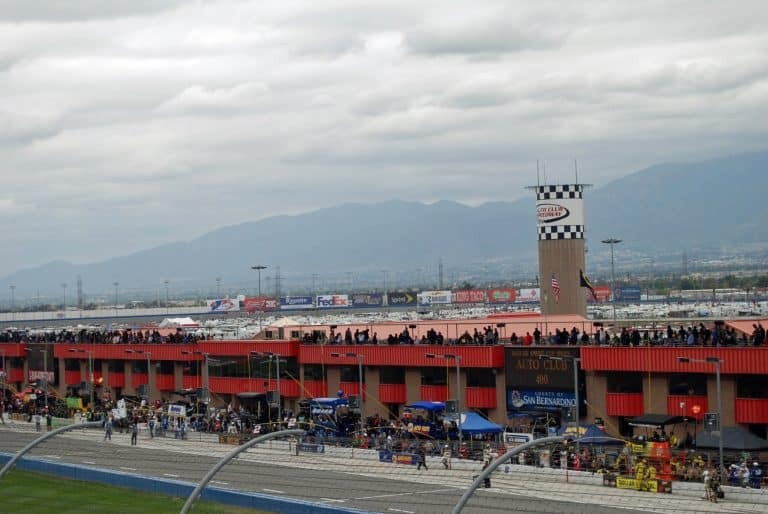 I’m taking the Challenger onto Auto Club Speedway on charity day. I donate $20 and make a memory of a lifetime. Give NASCAR a chance. Following NASCAR a blast. It’s a party. It’s a serious sport. It’s money. And it’s more fun than you’ll ever know, if you just give it a real chance. Stay tuned for more posts on the sport, including how to host a Daytona 500 party and how to follow Nascar without breaking the bank. Give it a chance, you won’t be sorry. The season’s just starting, and we are hosting our own party for Daytona, traveling to Atlanta and Las Vegas, and spending the whole weekend at Auto Club Speedway…and I can’t wait! You go girl! 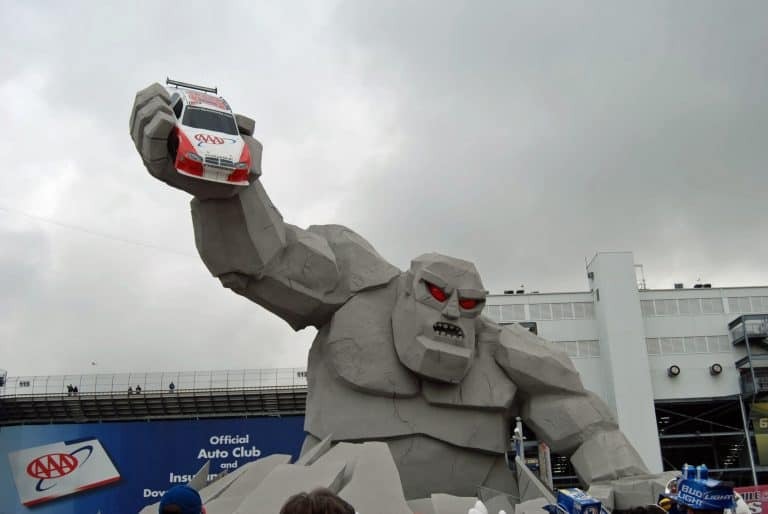 I live 30 minutes South of the Monster Mile! Next time you travel north, you let me know! My hubs and I go when it’s in town! 😉 Love the pics!